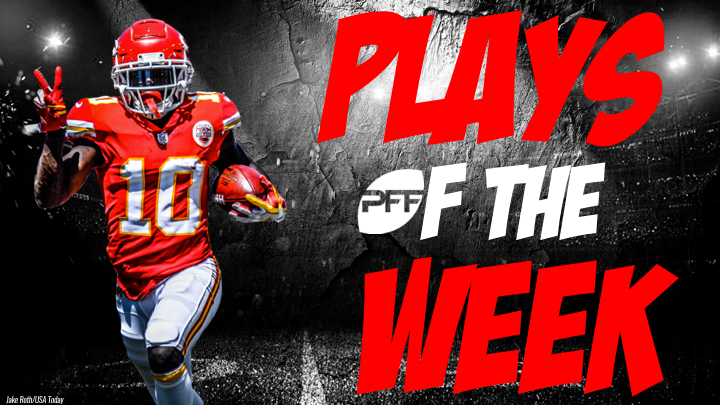 Welcome to the Plays of the Week for Week 17 of the 2018 season. Like every week, our team of over 500 analysts has dissected and graded every snap of every game to bring you the most detailed and valid analysis you can find anywhere. Below are the plays that earned our highest grades this week – who do you think produced the best play of Week 17? If you want to see how these players graded in their Week 17 games, check out all of our regular season advanced statistics and information with PFF Elite and Premium Stats 2.0. Cole Kneesley? A play he kneeded to make? Terrible puns aside, this is a catch of the year candidate. The Titans were always going to need big plays on defense if they were to have a shot at making the playoffs with a win over the Colts. They didn’t get the win, but they stuck around thanks to plays like this from linebacker Jayon Brown. The Mahomes to Hill connection has been money all season, and plays like this are why. One of the strongest arms in the NFL with one of the league’s fastest players on the receiving end is a terrifying combination. If you’re looking for reasons why the Texans can make a run, look no further than this play. Deshaun Watson puts it exactly where it needs to be, and he has the best receiver in the league making the catch. Josh Allen has had some impressive moments this season. This wasn’t one of them. This pass flew straight to safety Reshad Jones, and Jones took it straight back the other way for six. The NFL’s single-season record holder in yards by a tight end, George Kittle signed off a dominant season by sealing the record with some dominant work after the catch. This is just one of several jaw-dropping plays by Baker Mayfield in Sunday’s loss. After the pump fake, he puts the ball exactly where it needed to be for the big play downfield. The Steelers defense had held up pretty well until this excellent run by Joe Mixon, who shrugged off numerous tackles on his way to a big gain. Cody Latimer made some huge plays for the Giants in the season finale, beating cornerback Byron Jones here on the go route for the score. Putting the Steelers in a 7-0 hole in the second quarter, Shawn Williams benefited from the errant Ben Roethlisberger throw, taking it back the other way for a touchdown. It looked like the Ravens were about to lose late and cost themselves the playoffs again, before C.J. Mosley stepped up with the season-defining play. He read the play and dropped from his rush to seal the AFC North for the Ravens.